There are two terminals that comprise Munich International airport. Terminal 2 is specifically for Lufthansa and it’s flying partners and Terminal 1 is for all others. Lufthansa also flies out of Terminal 1, as I’d find out today. Deplanning in Munich is very efficient. It was a short walk down to the transit security area. 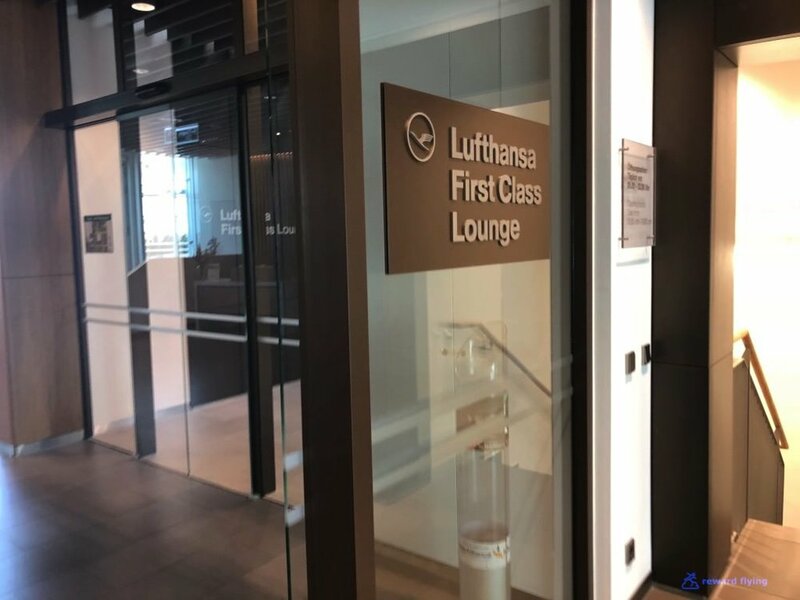 Then just past this checkpoint is an elevator up to the Lufthansa First Class lounge. You can’t miss it, It’s well marked. There’s a stairway up as well. The facility is shaped like an upside down “L”. With great views of the tarmac. Or work is you're so inclined. 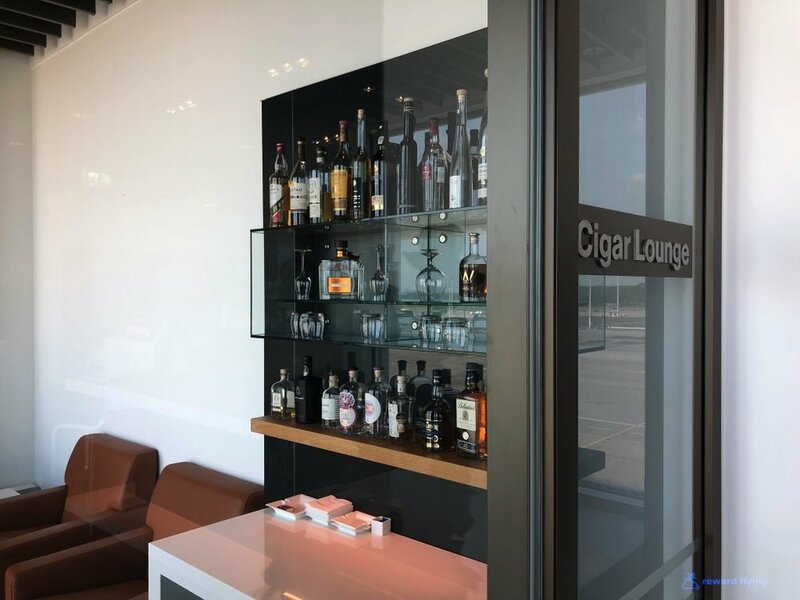 In the back is a smaller Cigar Lounge than the Frankfurt smoking lounge. Throughout the lounge were small sections that featured various food and drink. This display was an eclectic selection of flavored oils that I assume you could purchase. This could be dangerous, your own tequila bar. And a bigger display of wines being featured for the month. In the back are the shower / bathtub rooms. The bathtubs, as well as the room itself, were very similar to First Class Lounges in Frankfurt, minus one very important item. The rainshower was welcomed after the long flight from China. I’d skipped anything filling before LH723 arrived in preparation for the LH First Class experience. 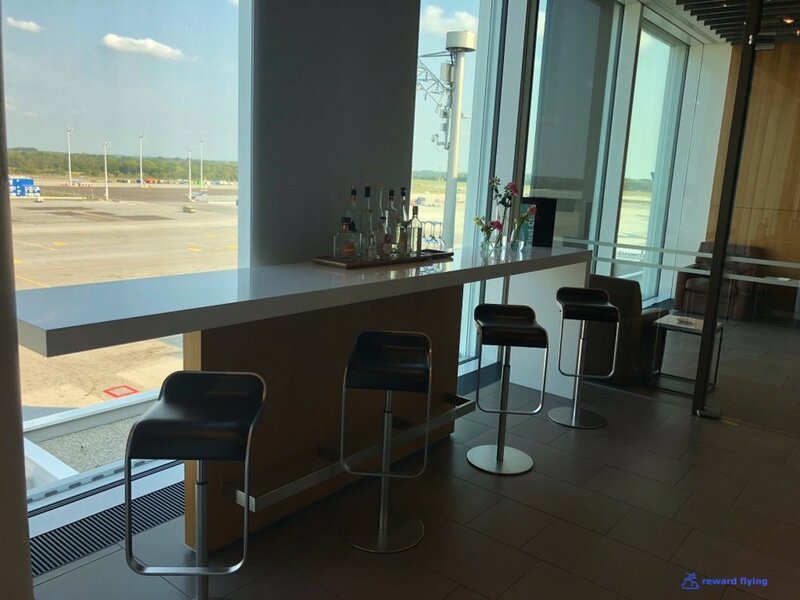 My flight to Frankfurt wasn’t leaving for 2 hours which was my plan to enjoy the lounge. There were other flights at 1 hour and 90 minutes. I asked the attendant, a very nice lady, to see if she could rebook me on the one in 90 minutes. She said she’d work on it and would find me in the lounge. I said I’d be in the dining room. First I had a look around the buffett. A fabulous selection of items that would make any other lounge blush. But I had long decided that I would be in the dining room comparing the Schnitzel which is so famous in Frankfurt. I sat down and was given the menus. Some much to choose from, but as you can see I was double crossed. TWO schnitzels, not one. Viennese and Signature. I ordered the Viennese style. About this time the agent came and and with a big smile said “I have you on the next flight! You should leave in 10-15 minutes”. I didn’t have the heart to ask to have the flight changed again. So I thanked her and fortunately the food came fast, as I was the only one in the dining room. Catering in Frankfurt is by D&O who are renowned for their excellent airline food. 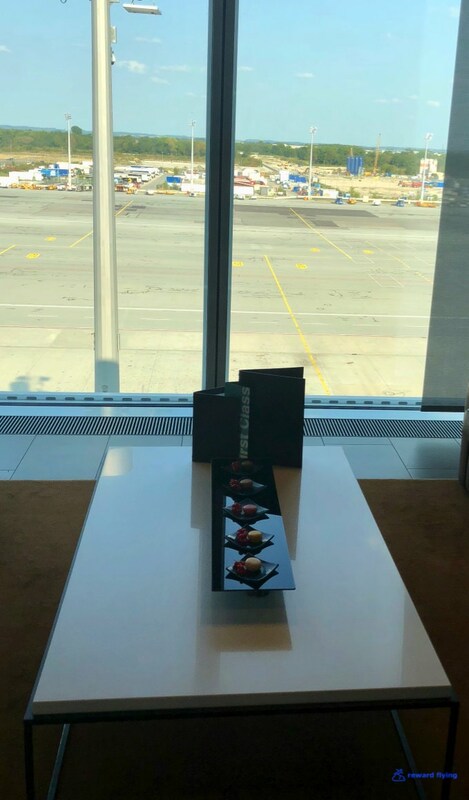 This lounge, as you may have noticed on the menus, is catered by LSG Sky Chefs, who don’t have that same renowned food reputation. I loved this dish. It wasn’t as greasy as the one in FRA, and the Cranberry preserve was a great accompaniment. And the German potato salad was insanely good. But I had to inhale everything as it was off to Frankfurt. Not even a chance to sample a dessert! So what was missing from the bathtub? On the way out I noticed there is an outdoor patio, which would have been perfect on this beautiful summer day in Munich. But I was in a rush to catch my delayed flight. Would I go back? Right now if I could.